For anyone who plans to buy a piece of hardware, the overall reliability of a vendor’s products and the quality of its service are important considerations. Unfortunately, much of the information that people use in deciding which product to buy is fragmentary and anecdotal–not the kind of data you’d want to base a three- or four-figure decision on. To obtain some hard data about which vendors have done the best job over the past year, we recently polled approximately 45,000 visitors to PCWorld.com, asking them about the mechanical soundness of their tech products–laptop PCs, desktop PCs, HDTVs, digital cameras, and printers–and about the quality of the tech support they received when those products required service. Perhaps the most surprising thing about our most recent survey results is how closely consumer opinions about reliability and service this year match those we reported last year. Schilling and Brent Potts, vice president of HP’s Web support operation, say that the company is focusing on three key areas: the initial design of its products, the products’ operational performance and reliability, and the way the company supports its products. The last of those seems to be getting most of the attention: HP says that it is ramping up its online FAQ archive, has radically expanded its forum-based support (where experts and users can get together to talk shop), has introduced video-based tutorials, and has built a new program called HP Ambassadors around a team of 50 experts who reach out directly to more-vocal customers (read: major bloggers) to help solve problems. On the other hand, as welcome as those changes sound, HP has not announced plans to increase its staff of tech support representatives. Hiring additional reps would no doubt be expensive, but it might also fundamentally change the experience that HP’s customers have when they call tech support for help. Schilling says that the company’s changes are already having a positive effect–one internal metric shows a 20 percent improvement in overall customer satisfaction in 2009–but she cautions that the cumulative effect of its various tweaks will take time to become visible in surveys like ours. 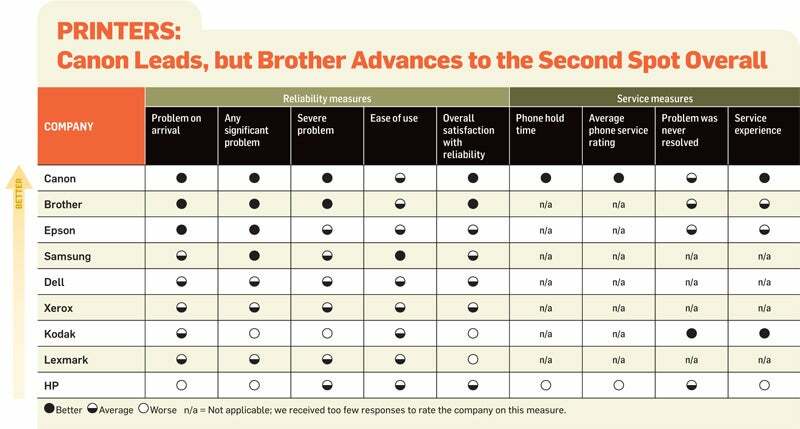 Cross-category comparison of reliability ratings from participants on our 2009 reliability and service survey. 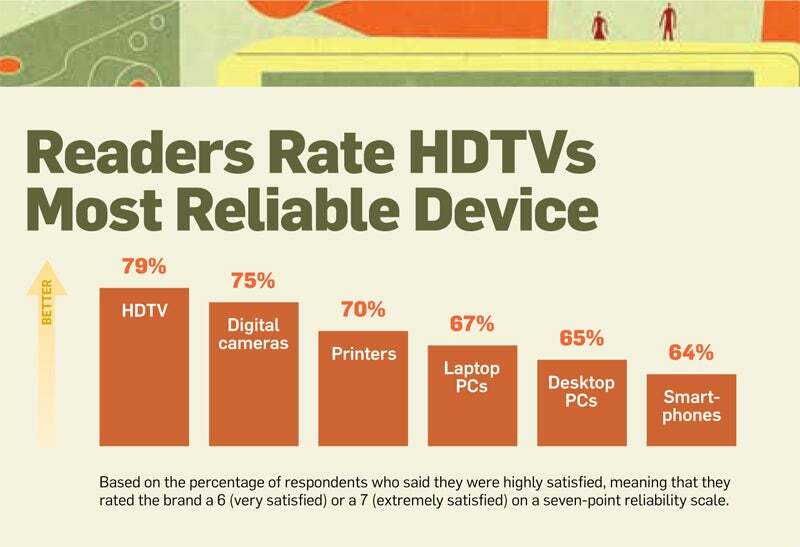 HDTVs ranked highest in reliability and smartphones lowest. When we last polled users, 10.2 percent of HDTV owners reported significant problems with their sets. This year, only 8.8 percent reported trouble. Surprisingly, that small shift is one of the biggest year-to-year changes in any category we investigated. What’s going on here? Is the industry simply doing the best it can do? Rob Enderle, principal analyst with the Enderle Group and a longtime follower of computer reliability trends, sees a standoff between two contradictory trends: The economic recession forced companies to cut corners–at the same time, however, increased efficiency in manufacturing and tech support offset the effects of those cutbacks. Not only have electronics producers severely reduced their manufacturing staff this year, Enderle says, but they have also continued to move toward cheaper and presumably less durable high-tech products such as netbooks. One explanation is that the industry is getting better at dealing with problems that cheaper parts have created–or at least at catching the problems before the products go out the door. Call centers may be improving, too, despite layoffs and what Enderle sees as continuing trends for call centers to migrate offshore and for support reps to receive less training. Upgraded software for managing relations with customers and better tracking of customer issues may mitigate problems that lower staffing levels tend to cause. And even though many consumers profess to hate them, automated service processes may be more helpful than critics think, enabling users to avoid long hold times in order to talk to a support rep. Re­­mote diagnostic capabilities probably have had a positive impact as well. Nevertheless, the consumers we polled don’t seem any happier with this year’s support landscape than they were with last year’s. Readers continue to complain about communication difficulties with overseas support reps and about the poor training that some tech staffers, whether foreign or domestic, seem to have received. Mark Mahnkey, an equipment calibration specialist in Everett, Washington, says that he ran into countless headaches when he tried to obtain a Vista installation disc for a Toshiba laptop he had purchased earlier in 2009. Fortunately for the company, few other Toshiba customers who participated in our survey shared that view: Toshiba re­­ceived the second-highest overall rating among laptop makers. Tryforos tried to follow the rep’s instructions, but even the smallest screwdriver she had was too big to fit into the slots on the machine’s screws. The tech support operator then abandoned that avenue and said he would mail her some software to fix the problem (software to fix a disconnected hard drive? ), and a week later Tryforos received a disc. Naturally, that strategy didn’t work, so HP finally agreed to take the machine back for repairs. Only after a couple of weeks of downtime and countless hours of troubleshooting did Tryforos get her laptop back in good operating condition. “At least they didn’t charge me,” she says cheerfully. Again this year, notebook PCs were one of the most trouble-prone sectors of the high-tech world, with 30.9 percent of respondents reporting that they had encountered at least one significant problem with their laptop; the figure in our 2009 report was 31.8 percent. Results of our 2009 survey of laptop PC reliability and service, by manufacturer. Apple once again earned the top marks in our survey, with above-average ratings in five categories and no below-average ratings. But Toshiba took over the second spot in our rankings, after having posted unspectacular results in last year’s survey (eight average scores and one above-average score). This time, Toshiba chalked up four above-average ratings, all in measures of product reliability. For its part, Acer again showed strong results, with three above-average ratings and none below par (up from two above-average scores last year). On the other hand, Dell took a rather startling tumble this year, from an upper-middle-tier ranking last year (featuring two better-than-average marks and one worse-than-average mark) to a finish near the bottom this time around (with one above-average score and four below-average scores). HP retains its hold on the bottom rung, due to subpar marks on six of our nine reliability and service measures. HP did improve its standing on the “problem on arrival” criter­ion (the company was about average on that measure this time around). Unfortunately, instances where HP tech support failed to resolve a problem increased, leaving the company below average on that important service measure. In our desktop PC ratings, Apple received better-than-average ratings on every question we polled users about–perhaps the best showing by any company in any product category in our survey. Meanwhile, Acer and eMachines repeated their shared (distant) second-place finish of a year ago, but with one above-average rating each instead of three each. Results of our 2009 survey of desktop PC reliability and service, by manufacturer. The big surprise this year was the improvement by Sony, which had been the worst performer in our desktops category last year, collecting three worse-than-average ratings and no better-than-average ones. This year, the tide turned in Sony’s favor: The company received average marks on every measure for which we received enough data, except on the “any core component problem” criterion. On that measure, Sony earned an above-average rating. 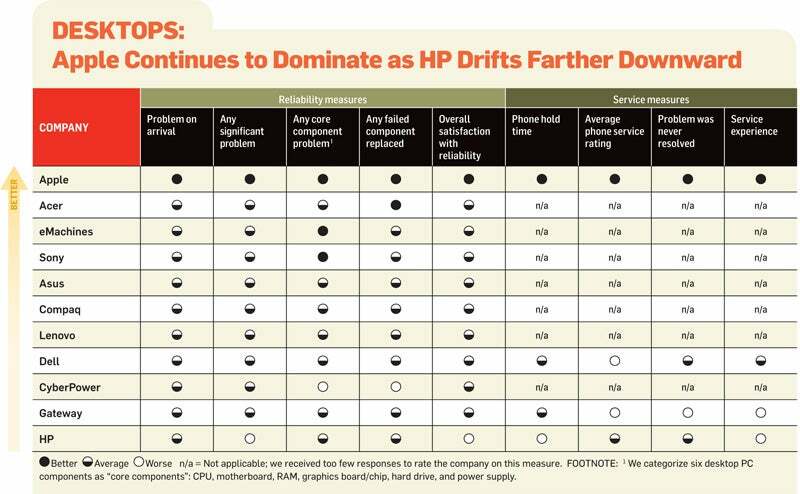 At the bottom of the list, CyberPower, Gateway, and HP had pitiful scores. Gateway concentrated its three subpar ratings on service and support measures, while both of CyberPower’s negatives came on reliability measures (the vendor didn’t draw enough responses on the service and support criteria to receive ratings on them). HP’s problems were more general: It collected four below-average ratings on measures ranging from general reliability issues to excessive hold times. Even though laptops have tricky assembly issues, limited space for components, and various risks associated with be­­ing carried around, readers in this year’s survey rated desktops as being significantly less reliable than laptops. Overall, users had 15 to 30 percent more problems with desktops than with laptops, depending on which reliability metric we asked about; the disparity may reflect vendors’ efforts to cut all possible corners to keep desktop costs at rock bottom. The HDTV category saw a bigger shake-up in reliability and service results this year than any other category, with some of last year’s top brands slipping and some of last year’s also-rans moving to the fore. 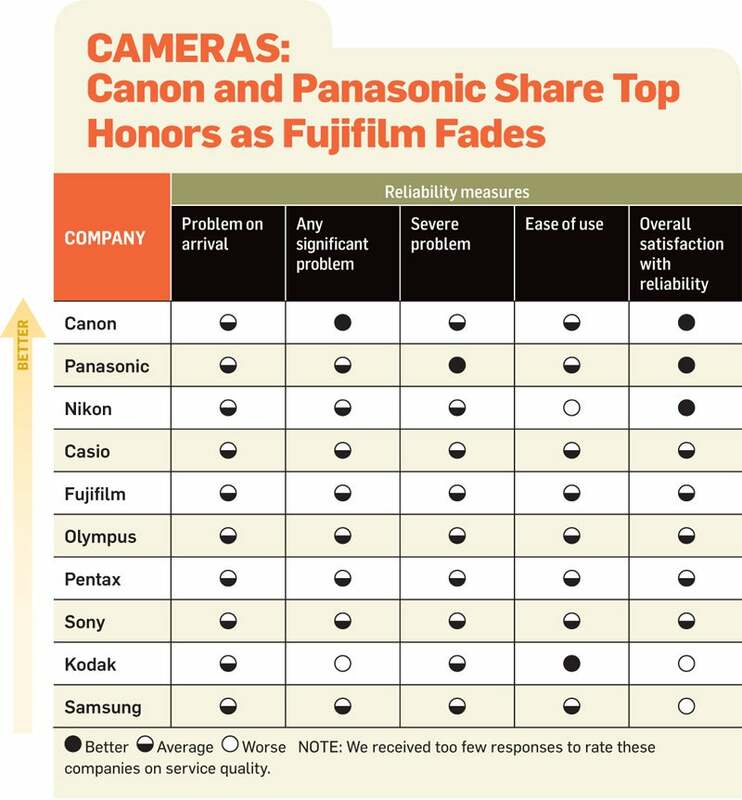 Three of last year’s reliability leaders–Sony, LG, and Samsung–saw their fortunes fade. Each had turned in numerous better-than-average scores in our 2009 report, but all three rated as merely average across the board in this study, leaving them jostling in the middle of the pack with such brands as Magnavox and Vizio. And Insignia, new to our re­­port this year, bypassed all of those brands on the strength of one better-than-average rating. 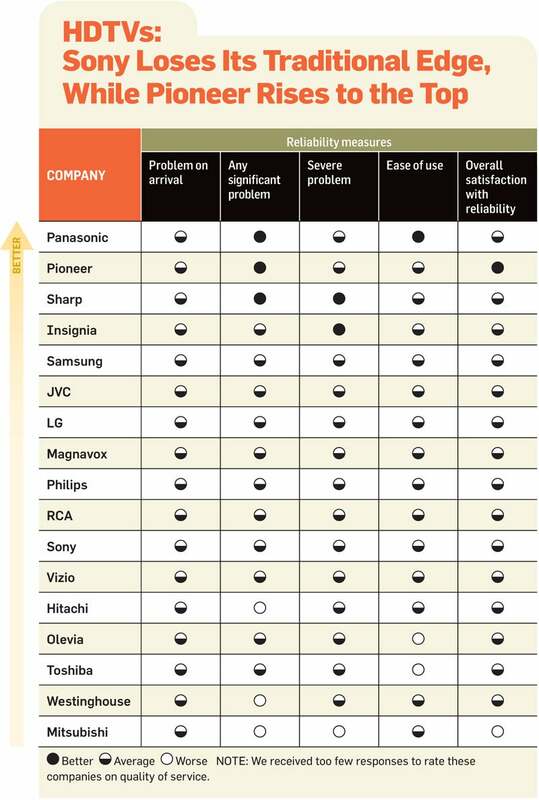 Results of our 2009 survey of HDTV reliability, by manufacturer. The new champs? Panasonic, Sharp, and (in a major surprise) Pioneer. Earning two better-than-average scores each, Panasonic and Sharp simply maintained their ratings from last year while the previous leaders slid backward. Pioneer, however, leaped forward to tie them (after receiving all average ratings last year), and it garnered the only better-than-average mark in readers’ overall satisfaction with their TVs. We were pleased to see JVC earn average scores across the board; last year it finished next-to-last, with three worse-than-average scores. To be fair to Mitsubishi, a significant number of the complaints we received in our survey came from owners of Mitsu­bishi rear-projection HDTVs whose bulbs had burned out. Those bulbs, our readers tell us, can run anywhere from $100 to $250 to replace, depending on the particular TV model. The reliability of high-definition televisions seems to be improving overall, though not by leaps and bounds. Only 1.7 percent of users reported problems with their TVs when they first unboxed them this year, and 4.7 percent of users reported severe problems during the lifetime of their sets. The corresponding figures last year were 2.6 percent and 5.4 percent, respectively. Was it a fluke? Last year Fujifilm astonished us with an unexpected top-drawer showing, ranking alongside Panasonic as the most reliable camera brand on the market. This year the camera rankings shifted: Fujifilm sank back into the middle of the pack, and traditional category powerhouse Canon returned to the top of the list, where it had been a stalwart in prior years. Results of our 2009 survey of digital camera reliability, by manufacturer. At the bottom of our rankings this year are Kodak and Samsung, both of which received worse-than-average scores for “overall satisfaction with reliability” compared to their peers in the camera market. Kodak owners report high satisfaction levels with their cameras’ ease of use, but report a higher-than-average rate of significant problems. Samsung cameras don’t incur any more actual problems than other brands, according to readers, yet owners of the cameras report lower-than-average satisfaction levels with the general reliability of the cameras. In the printer category, the results of this year’s study looked oddly familiar. That’s because the reliability numbers for consumer printers were almost unchanged from last year. For instance, in the new survey 7.0 percent of printer users reported severe problems with their machines, a statistical dead heat with last year’s 7.2 percent. Results of our 2009 survey of printer reliability and service, by manufacturer. The year-to-year data for individual printer manufacturers in our survey looks similar, too. Canon again sparkled, with better-than-average ratings on seven criteria (last year Canon earned above-average marks on eight measures). For its part, Brother took some impressive strides upward, nabbing four better-than-average marks (up from just one the year before) and supplanting Samsung at number two. This year, Samsung finished in a virtual tie with Epson, as both brands collected two better-than-average ratings. (Last year Samsung carded two above-average marks, and Epson one.) Notably, Samsung received the highest rating in the survey for ease of use, besting even Canon. Dell also made some laudable strides this year, transforming last year’s two below-average ratings into average ones across the board. Kodak, however, experienced a downturn: Though owners of its printers felt good about Kodak’s tech support, they gave the printers poor marks for reliability. HP cemented its spot at the bottom of the chart with five below-average ratings, matching its performance in last year’s survey. As in the past, however, HP’s poor reliability and service scores haven’t hurt its market share: Half of our respondents in the printer category remain HP customers…happy or not. We asked PCWorld.com visitors to rate vendors in five product categories: laptop PCs, desktop PCs, HDTVs, digital cameras, and printers. In each category, we rated each vendor in nine specific areas of customer service or product reliability. On each measure, we determined whether the vendor’s score was significantly better than the average mark, not significantly different from the average, or significantly worse than the average. If a vendor drew fewer than 50 responses on a particular measure, we discarded the results as statistically unstable. (This threshold requirement prevented us from rating some smaller vendors.) The information reported in our article is thus not raw data, but variability from category averages. Problems on arrival (all devices): Based on the percentage of survey respondents who reported any problem with the device out of the box. Any significant problem (all devices): Based on the percentage of survey respondents who reported any problem at all during the product’s lifetime. Any failed component replaced (laptop and desktop PCs): Based on the percentage of survey respondents who reported replacing one or more original components because the components had failed. Core component problem (laptop and desktop PCs): Based on the percentage of survey respondents who reported problems with the processor, motherboard, power supply, hard drive, system memory, or graphics board/chip at any time during the life of their laptop or desktop PC. Severe problem (HDTVs, cameras, and printers): Based on the percentage of survey respondents who reported a problem that rendered their device impossible to use. Ease of use (HDTVs, cameras, and printers): Based on the percentage of survey respondents who rated their device as extremely or very easy to use. 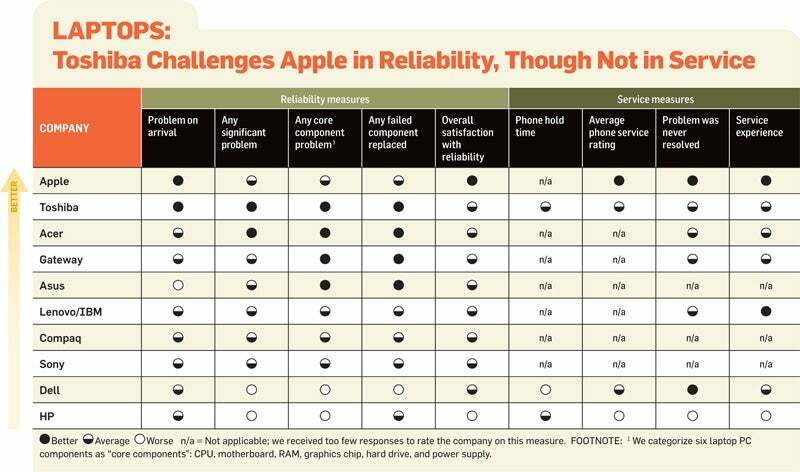 Overall satisfaction with reliability (all devices): Based on the owner’s overall satisfaction with the reliability of the device. Phone hold time: Based on the average time a product’s owners waited on hold to speak to a phone support representative. Average phone service rating: Based on a cumulative score derived from product owners’ ratings of several aspects of their experience in phoning the company’s technical support service. Among the factors considered were whether the information was easy to understand, and whether the support rep spoke clearly and knowledgeably. Problem was never resolved: Based on the percentage of survey respondents who said the problem remained after they contacted the company’s support service. Service experience: Based on a cumulative score derived from product owners’ responses to a series of questions focusing on 11 specific aspects of their experience with the company’s service department. We polled roughly 45,000 PCWorld.com readers who responded to e-mail messages. We used methods of statistical analysis to determine which companies were significantly better or worse than the average, based on all responses about a certain product type. Because our survey sample is heavily weighted toward generally tech-savvy readers, it may not be representative of the general population, which may have different expectations and experiences with technology products.